Over the last three days I have been working on a project that I finally finished; but everyday a different Warbler or Vireo came to my studio window. I want to paint them all! I mean, how fortunate am I to see them prancing around right in front of my window! First was a female Common Yellow throat, then came a Yellow- Rumped Warbler and today a Bell’s Vireo came to my window. “I can’t paint you now”, I say, “You are all temptresses trying to keep me away from my projects! Can’t you come back next week when I am finished?” But this is not how nature works. How many times do we ask for rain but not onTuesday when we are planning a picnic. I love that nature is just outside my window, talking and talking if I only listen. I put a hummingbird feeder so close to my window that I can see the brilliant details of the visitor’s features. My feeder also attracts tons of ants, but it’ s a small price to pay for the vision I have of those feasting jewels. 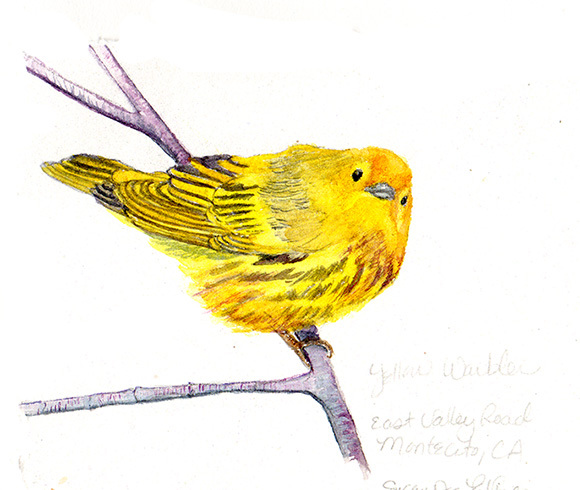 The yellow warbler below will have to suffice until I take the time to paint them all, and I will!